Zlotnikov A.K., Gins V.K., Pukhova, F., Kirsanova, V. (2005) Albit accelerates development of agricultures. Protection and Quarantine of Plants Nr.11. p. 27-28. Farmers of Northern and Siberian regions of Russia well know about the following problem: cereals and other crops do not have enough time for formation of full-fledged harvest due to short vegetative season of year with unfavourable weather conditions. Autumn rains and sometimes snow, that fell too early, can lead to reducing or even loss the crop. Also, many modern pesticides elongate plant vegetation period, and delay plant maturation. Using of early ripening varieties of plants as well as desiccants will be the solving of this problem. However, this variant not always permissible and justified. In this case, Albit is indispensable helper for farmer. In Krasnoyarsk kraii, Vologda, Novosibirsk regions, Finland, Estonia and other northern regions, Albit accelerates ripening of plants by 3–14 days. During many years, Albit allows you to start earlier harvest and preserve crop. In more southern regions, the same effect of Albit was observed on soybean, maize and sunflower. Albit influences on plants during the whole vegetative period, stimulating the processes of plant differentiation (see Mechanisms of Albit action). Changes of the following parameters are observed: biometric characteristics of vegetative growth (germination, development of root system, tillering capacity, duration of phenological phases, etc.) and characteristics of crop structure, such as the number of grains per ear, weight of 1000 grains, marketability of potato tubers, weight and diameter of sunflower head, etc. Specific mechanisms of Albit influence on different plant organs which determine increased resulting yield are different for different cultures. In trials of All-Russia Institute of Leguminous and Groat Crops and Agricultural Scientific Institute of South-East it was established that increase of buckwheat yield occurs due to increase of amount of seeds (without changes of single seed weight), whereas increase of millet yield occurs mainly due to increase of seed weight. Analogously, according to data of All-Russia Plant Protection Institute and Agricultural Scientific Institute of South-East, Albit do not demonstrates any influence on number of seeds in soybean pod, but increases number of pods per plant, whereas increase of sunflower yield occurs mainly due to increase of number of seeds in head. Important mechanism of yield increase of rice is redistribution of seed formation from lateral panicles to the main one. Increase of yield of eared cereals is formed by combination of several mechanisms: improvement of tillering, increase of single seed weight, increase of number of seeds in ear. Also, Albit helps to reduce ear emptiness by 20% (for rice, analogous characteristic is reduced by 1-6 %). As is well known, root rots of cereals considerably decrease productive tillering, number of seeds in ear and weight of seeds. Possible, high effectiveness of Albit against root rots also makes contribution to improvement of yield characteristics. Table 6. Influence of presowing seed treatment with Albit on germination of different agricultures (according to results all performed trials, 1997-2004). As a rule, stimulating activity of Albit can be detected even in earliest stages of plant growth that is manifested in increased germination (Table 6). Increase of germination of spring wheat, sunflower, legumes and vegetables might reach of 10-15% due to Albit. Positive influence of the formulation on germination in laboratory and field conditions was detected for the majority of agricultures, and Albit’s influence in field conditions is more pronounced. For example, in laboratory trials performed by Albit LLC, Albit increased germination of wheat and barley by 3-4%, whereas increase of germination in field conditions (according to results of long-term trials in different regions of Russia) was 2-15%. Influence of Albit on germination capacity (energy) is exhibited in the same manner. Thus, Albit increases germination capacity of cereals by 1-10% (5.8% averagely). Increase of germination and germination capacity is accompanied by increase of weight of shoots (by 3-5%). As was revealed in experiments of laboratory of Albit LLC, while treatment of seeds with commercial formulations based on triterpene acids results in analogous stimulation of germination, treatment with Albit also leads to balanced growth stimulation of both over- and underground biomass. Under influence of Albit, weight of shoot roots is increased by 4-7%, length of roots – by 6-11%. Simultaneous stimulation of germination, growth of over- and underground biomass with Albit helps plants to resist diseases and to assimilate nutrients from very beginning of development. Otherwise, according to our data, stimulation of just vegetative growth which is not accompanied with growth of rootage, make plants more sensitive to diseases, for example, to root rots. Albit improves development of strong rootage and forming of secondary roots of cereals and other plants. As it was demonstrated in field trials, treatment with Albit increases root length of winter wheat, pea, rice, buckwheat averagely by 11, 11-41, 9, 16-37% respectively. Early acceleration of root growth helps plants to better resist drought and root rots and paves the way for future higher yield. winter survival and drought resistance. As mentioned above, one important feature of Albit is its ability to visibly accelerate alteration of phenological phases of agricultures. According to obtained data, for cereals this acceleration is 3-14 days (Zashchita i Karantin Rastenii (Plant Protection and Quarantine). – 2005. – № 11 (In Russian)). 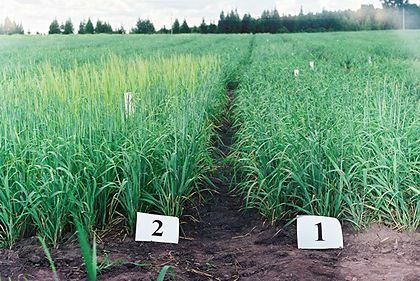 According to long-term field trials in ОАО «Kоrkinоаgrоprоmkhimiya» in Krasnoyarsk region (since 2007), crops after Albit treatment become more early-ripe, annually maturing by 1-2 weeks earlier. It allows to harvest before autumn rains (or even before snow). For example, 1 fold Albit application allowed to start harvest by 5 days early, than on fields without Albit treatment (farm Cheremushka, Balahtinskii region, 2009). 2 fold Albit application (with herbicide and fungicidal treatments) allowed to grow wheat (crop yield 3.1 t/hа) with a high baking parameters (26-28% of gluten) and start harvest on August 14 – by 12 days early than in other farms of this climatic zone (farm Plemzavod Taezhnii, Suhobuzimskii region). In 2017, early snow was observed, and Albit application allowed to harvest in all farms of this region where Albit was applied. Acceleration of plant development was observed on different crops and in various geographical areas. For example, spring barley matures earlier after Albit treatment, than in control. 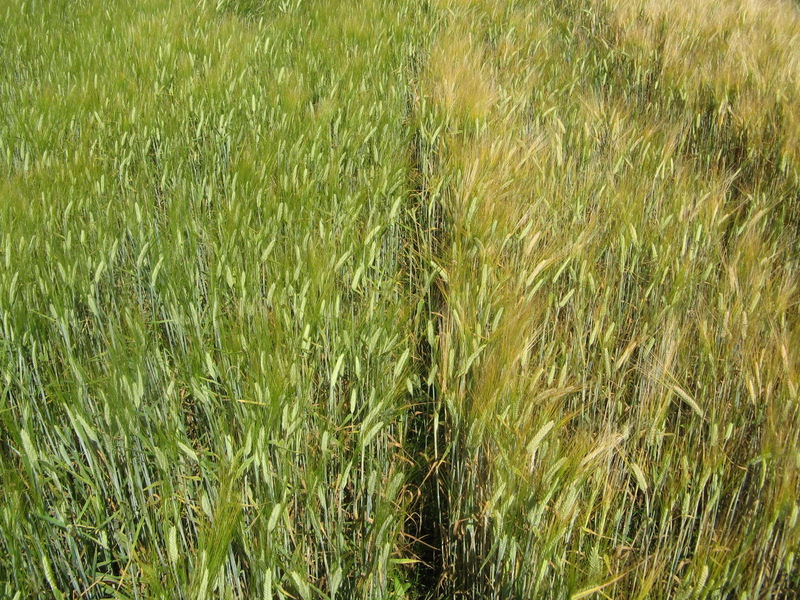 In addition to acceleration of maturation, under Albit treatment yield of barley increased by 11.4%. For example, in trial performed by Tula Regional Plant Protection Station (2003) on spring barley var. Zaozerskiy-85, treatment with Albit (one presowing treatment and two foliar sprayings) accelerated alteration of phenological stages, and the difference with control sets was getting more pronounced with time: coming of EC stage 31 in set with Albit was 3 days earlier than in control, whereas coming of EC stage 83 – even 12 days earlier. On the contrary, treatment with standard chemical fungicide based on a.i. tebuconazole led to delay of alteration of phonological stages by 1-5 days comparing to control. In trial performed by Voronezh Regional Plant Protection Station (2002), seeds of spring barley treated with Albit germinated 3 days earlier than in control (24th of May instead of 27th). In trial of All-Russia Institute of Plant Protection RAAS on winter wheat (2004), 10 days after sowing the germination of Albit-treated seeds was 60%; in control set germination was 50%; in set treated with chemical standard based on a.i. difenoconazole and cyproconazole, germination was just 10%. In trial of Lipetsk Regional Plant Protection Station (2003) on winter wheat, coming of EC stage 50-51 was detected after 47-54 days of growth in set treated with Albit, and after 51-62 days in control. In trials performed by the same institution in 2002 with spring wheat var. Prokhorovka, coming of EC stage 83 was detected on 78-81 days of growth; in control set it was detected on 85-87 days; in set with application of standard chemical protective treatment (presowing treatment + foliar spraying with chemicals based on a.i. tebuconazole, spiroxamine and triadimenol) – on 90-95 days. The dynamics of alteration of phonological stages is demonstrated on diagram (Fig. 2). As you can see, coming of next phases in set with Albit treatment was earlier than in control and in set with chemical treatment throughout all vegetation. Fig. 2. Influience of different variants of treatments on alteration of phonological stages of spring wheat (Lipetsk Regional Plant Protection Station, 2002). This growth stimulating feature is even more pronounced for combinations of Albit and chemical fungicides (seed treatment agents). For example, in trial of All-Russia Institute of Biological Plant Protection performed on barley in 2005, plants treated with mix of Albit and decreased rate of chemical fungicide based on a.i. thiabendazole and flutriafol, reached EC stage 50-51 while plants treated with chemical fungicides only were just in EC 30; acceleration of development was clearly visible (Fig. 3). In other words, advance of development was about 15 days. Accelerated development of plants at application of combinations of Albit with fungicides is due to not only growth stimulation activity of Albit, but also due to its ability to relieve stress effect of chemical pesticides. In details, it is described here. Acceleration of alteration of phonological stages due to application of Albit was detected not only for eared cereals, but also for other cultures, for example, for rice (All-Russia Institute of Biological Plant Protection, 2004) and sugar beet (All-Russia Institute of Plant Protection, 2003). In trial of Tula Regional Plant Protection Station on sugar beet var. Ramonskaya-47, 2 weeks after treatment with Albit plants had 5-6 pairs of real leaves, whereas plants in control set had just 2-4 pairs. In 2003, farmers of Tambov oblast managed to harvest yield of sunflower seeds before autumn rains due to accelerated maturation of sunflower on Albit-treated fields. In collective farm Kushchevskoe of Krasnodar krai, physiological ripeness of sunflower seeds on fields treated with Albit came 1 week earlier than in control set. In tests performed by leading potato growing collective farm ‘Meristemnye kultury’, shoots of potato came up 15-24 days after planting in variant with using of chemical pesticides, whereas shoots of potato treated with Albit came up after 12 days. According to data obtained by collective farm Odoyevskiye zori (2004), application of Albit made possible harvesting of potato 1 week earlier than in control. In trial of All-Russia Flax Institute (2004), flax plants grown on plots treated with mix of Albit and herbicides based on a.i. chlorsulfuron and quizalofop-p-ethyl demonstrated abundant blossoming by 8th of July, whereas plant treated with pure herbicides were just in very beginning of blossoming. In trials of All-Russia Institute of Vegetable Selection and Seed Breeding (2001-2003) on vegetables (tomato, cucumber, sweet pepper) application of Albit lead to accelerated and more simultaneous ripening; yield was almost completely harvested in 1st and 2nd harvesting; Along with total yield, early yield was also increased. Control set and sets with application of chemical analogues demonstrated more late and ‘prolonged’ ripening. Table 7. Influence of Albit on characteristics of growth structure and yield of eared cereals in field conditions. Thus, acceleration of growth and ripening of agricultures is universal and characteristic property of Albit. Obviously, this phenomenon depends on activity of endogenous salicylic acid, formed in plants under Albit treatment. Besides, Albit promotes accumulation of antioxidants in plant cells that eases accelerated forming of new structural elements of plant organism, and saves metabolites, which can be used for plant growth. Accelerated plant growth due to Albit might be unfavorable sometimes. For example, accelerated growth of winter cereals might lead to their overgrowth and ‘sweatening’. Therefore foliar spraying of plants is recommended to perform after hibernation. But anyway, in most cases this property of Albit is positive for plants. In 2003, farmers of Tambov oblast managed to harvest yield of sunflower seeds before autumn rains due to accelerated maturation of sunflower on Albit-treated fields. Incorporation of Albit into cultivation of sugar beet shortens its vegetation period and therefore makes possible harvesting of good yield even in very north of its cultivation area: in Moscow oblast and in republic of Mordovia. Acceleration of plant growth and alteration of phonological stages is especially important for regions with continental climate (such as Povolzhye and Siberia) which limits vegetation periods. decreases ear emptiness by 20%. In trial performed by Soil Institute (2002), treatment of seeds with Albit increased number of seeds in ear of spring wheat by 2, following foliar spraying also added 2 more seeds. Field and greenhouse flowers (roses, gladiolus, pinks, cyclamens, Kaffir lily, amaryllis, violet, primula, etc. ): earlier blossoming (by 3–15 days), increase of blossoming duration by 4-35 days (up to 1.5-2.5 times), improvement of decorative appearance, increase of number of flowers per plant. Important features of Albit are blossoming induction, acceleration of opening of flowers, providing of more good and even blossoming, increase of number of flowers per plant. Although this phenomenon was shown for wide range of plant species, it is flowers and decorative cultures that demonstrate the most pronounced and clear response to Albit. It is well known that watering of indoor flowers (geranium, primula, amaryllis, violets, azalea and others) with Albit solution considerably increases longevity and intensity of blossoming. For example, Kaffir lily (Clivia miniata) at the head office of Albit LLC blossoms during major portion of winter, spring and summer, that is far out of the typical blossoming period from January to April (Fig. 48). Induction of blossoming is most pronounced for flowers, but it is also primary important for all agricultures. Blossoming induced by Albit was detected for most cultures (cereals, legumes, apple, currant, vegetables, forage grasses) and is very important for yield increase. In trials conducted by All-Russia Institute of Plant Protection and farmers of Krasnodar krai it was shown that foliar spraying with Albit promotes redistribution of metabolites from leaves of sugar beet into root. Analogous redistribution of nutrients from vegetative organs to seeds induced by Albit was detected in trials of Department of Agrochemistry of Moscow State University on spring barley (Table 8) and in trials of Aleysk Station of Agrochemical Service on spring wheat. In trial of Department of Agrochemistry of Moscow State University, yield increase of straw was twice smaller than that of seeds, whereas in control set the yield of straw and seeds was approximately equal. In other words, positive influence of Albit was more significant for forming of generative organs. In trial of Aleysk Station of Agrochemical Service, treatment with Albit intensified arrival of nitrogen, phosphorus and potassium to seeds, but decreased that to straw, that indicates redistribution of nutrients to seeds under influence of Albit. Long-term data of many scientific institutions indicates that application of Albit leads to additional seed setting of cereals and legumes, increases setting of fruits of apple, currant and vegetables. These facts demonstrate that influence of Albit on agricultures is not just stimulation of vegetative growth. Of course, accelerated vegetative growth lets plants accumulate sufficient amount of metabolites. However, with the lapse of time stimulation of growth gets accompanied with stimulation of earlier blossoming, formation of generative organs and redistribution of nutrients to them, that finally provide high yield increases.